Apparently SRAM thinks my decals are TOO GOOD! 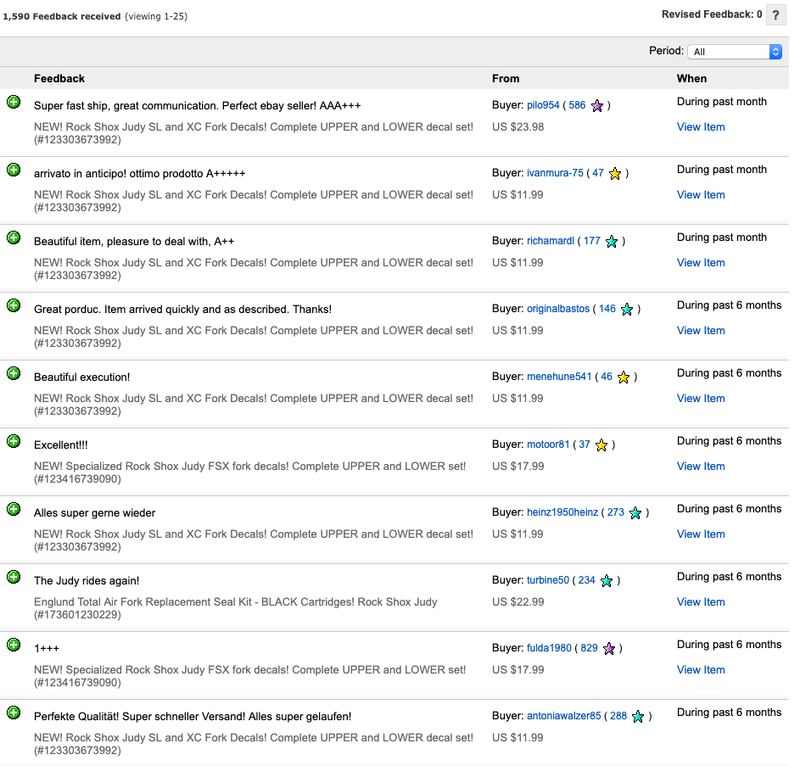 They had my listings removed on eBay after almost 10yrs(!) of selling these to support the VRC crowd! 2019 Update! Decals are available! Get them while they last. I won’t be making any more once my current run is finished. When they’re gone, they’re gone! 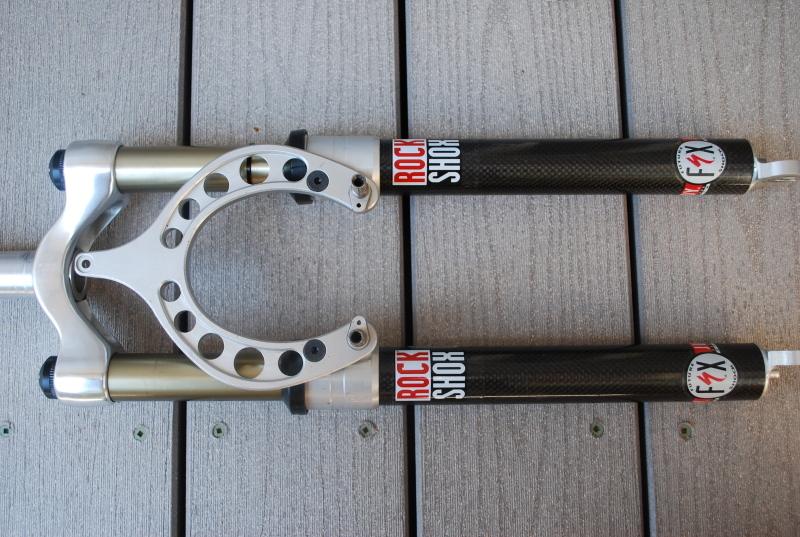 Specialized Rock Shox Judy FSX lower leg fork decals only! NEW! 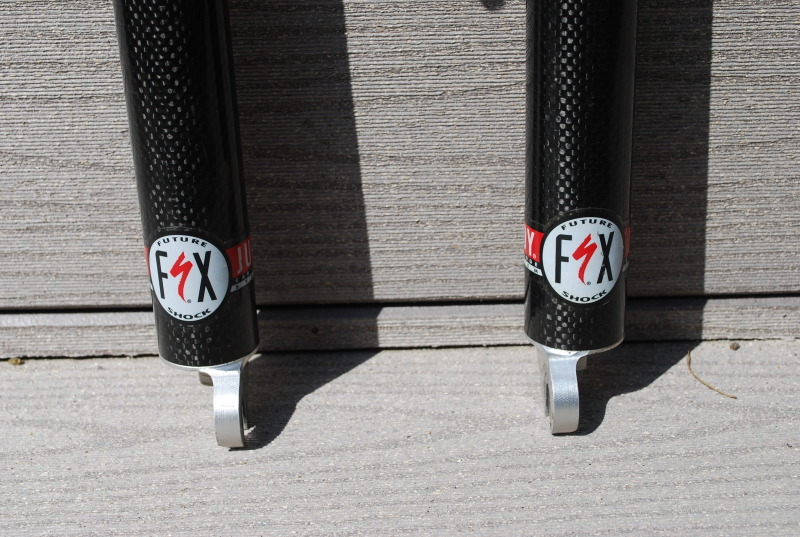 You are looking at a set of incredibly high-quality reproduction decals for your vintage Rock Shox Judy FSX forks! Like you, I had a vintage bike to restore, and the original decals on my Judy forks were toast! I wasn’t happy. It was the one thing that kept my bike from being “perfect” again. 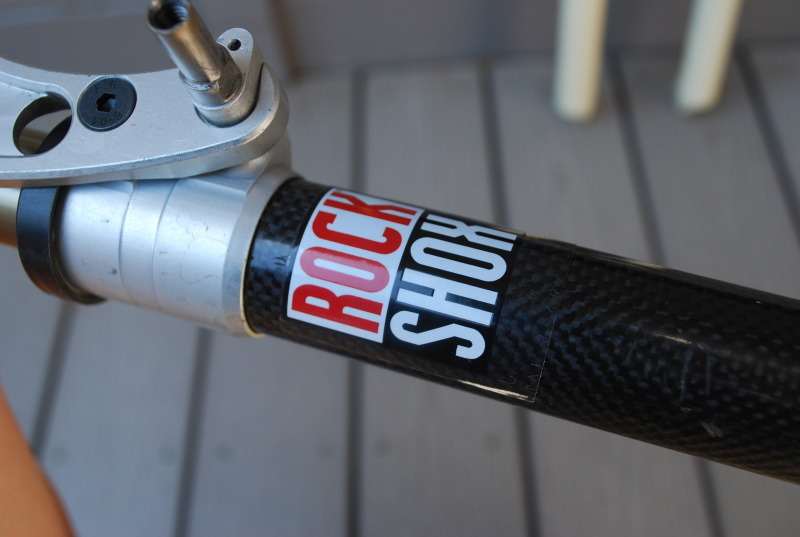 So I took it upon myself to rebuild, recreate, redesign, the original Rock Shox Judy decals. I’m a professional graphic designer, so I knew I could do it. After many, many hours of carefully measuring the original decals, scanning, fixing and tweaking, here is the final result. It’s perfect. Even more perfect than the original decals ever were. They are the exact size of the originals. The perfect finishing touch. Bring your tired, beaten forks back to their former glory! These decals are truly the highest quality reproduction decals you will ever find anywhere. Each detail was painstakingly recreated with laser-sharp perfection. Everything was measured and aligned to be a perfect match with the original. On top of all this, I went the extra mile (and expense!) 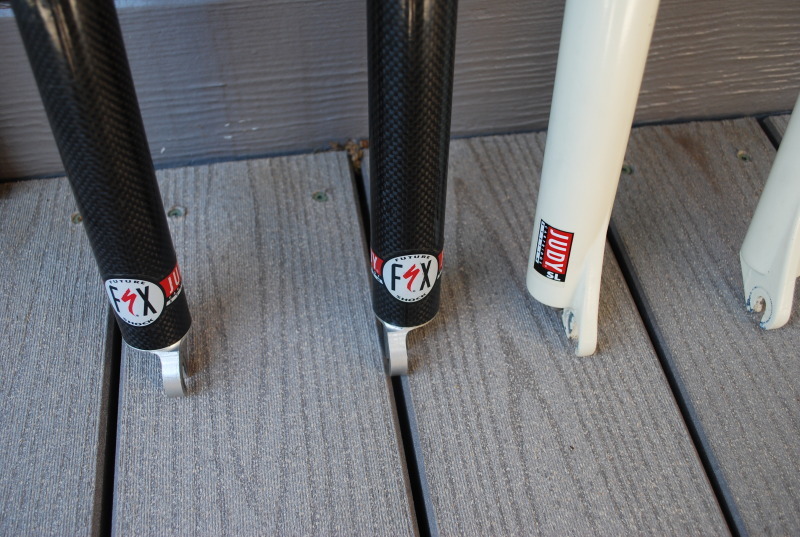 and the “FSX” decals are custom “die cut”, which means they are pre-cut and shaped just like the originals. Even better, the corners of my FSX decals are rounded to prevent the peeling that was so common to the original decals. These decals are clear, just like the originals. The decals are printed using the highest quality silk-screening techniques. Silkscreen printing is an incredibly high-end method with which to print stickers. As far as sticker printing goes, silkscreen is simply the best the way to produce an extremely high caliber, high quality sticker. Once you begin to understand the silkscreen process and see the results of the printing medium, you will quickly realize that in terms of quality, there is no contest. Thick Ink. At least 2-3 times thicker than other silkscreen stickers and 10x-20x thicker than digitally printed stickers. 100% UV Protection with Multiple Passes. Each full-color sticker is silkscreened onto a thick vinyl surface with 4 thick coats of ink, and 3 thick coats of clear gloss with 100% UV protection. Weather proof and waterproof. Effective outdoor capability is 2000-3000% higher than Digital/Flexo materials. Photo Realistic Printing. No visible “dots” or line screen. Continuous tone, super vibrant colors. Extreme durability. Minimum 3-5 year effective capability against any weather. Actual lifetime should be substantially higher since you aren’t riding everyday! Extremely durable in extreme conditions (like mountain biking!). Silkscreen stickers are the only way to go if you are looking for durability. International shipping: USD $1.25 by First Class International letter. Please allow up to 14 business days, but usually about 7-10 business days. This entry was posted in Bikes on February 11, 2014 by bryanus.